NASSAU, BAHAMAS April 15, 2019— As a busy spring break travel period comes to a close, key stakeholders at Lynden Pindling International Airport (LPIA) will continue operational measures to manage heavy traffic anticipated over the Easter holiday weekend. In February of this year, 322,596 passengers moved through LPIA, up 21.9% year-over-year with similar growth trends expected when March actual passenger numbers are tallied. Nassau Airport Development Company (NAD) officials are expecting additional growth in passenger numbers during April and in particular over the four-day period between April 19 (Good Friday) and April 22 (Easter Monday). “We have seen high passenger traffic in-terminal over the past 15 months with an 11% growth year-over-year in 2018 and figures for the first quarter of this year showing growth of 20% over prior year. For the upcoming Easter holiday period, we are continuing to evaluate and tweak our SOPs in real time to accommodate larger passenger volumes in our facilities,” Vernice Walkine, President & CEO of NAD explained. Earlier this year, all agencies were presented with the SOPs based on their role of execution in the overall airport operations. Entities are also given projected passenger numbers three days prior to anticipated peaks, allowing them sufficient time to review and schedule manpower accordingly. The passenger projection charts detail arrivals and departures traffic in hourly intervals and highlight peaks within each of the three terminals at LPIA. This is a powerful tool when used in conjunction with historical passenger numbers. A busy day for international arrivals at LPIA is approximately 5,000 passengers. In February, the airport recorded nine days with international arrivals between 6,000 – 7,500+ passengers. 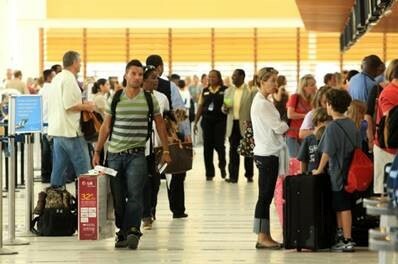 On March 9, a record breaking 8,245 passengers were processed through Bahamas Immigration and Customs. In US Departures, busy days are when 5,000 passengers are processed through the preclearance facility. During the first quarter of 2019, officials logged multiple 6,500- 7,000 passenger departures days. On the airside, LPIA recorded a total of 13,114 aircraft movements in January 2019 and 12,386 in February 2019, up 8.58% over the previous year. For the Easter holiday weekend, LPIA’s operations plan will focus on processing areas including pre-board screening in the US Departures terminal and the International/Domestic Departures terminal as well as queue management in US Customs, Bahamas Immigration and Bahamas Customs. All areas should be well-staffed and queue times in the terminals should be 30 minutes or less. Stakeholders will also continue customer-focused measures implemented earlier this year. To expedite the flow of passengers on arrival, officers in the Bahamas Immigration Hall will process large families with young children and senior citizens on separate lines during the peak periods between 12pm – 3pm. NAD Operations team will again position Line Management Agents (LMAs) to organize traffic flow in the US Departures Terminal check-in hall with the goal of processing times falling within a 30-minute window. With passenger estimates projected to exceed Easter 2017 and 2018, airport officials are encouraging the traveling public to allow for sufficient processing times on travel days and to stay tuned to NAD’s social media channels and communicate directly with airlines for important travel updates. NAD along with the Nassau/Paradise Island Promotion Board, the Ministry of Tourism and LPIA commercial partners will host holiday themed activities in-terminal featuring musical entertainment from local schools and bands, LPIA’s Baggage Claim Game in the International Arrivals terminal and a visit from the Easter Bunny.